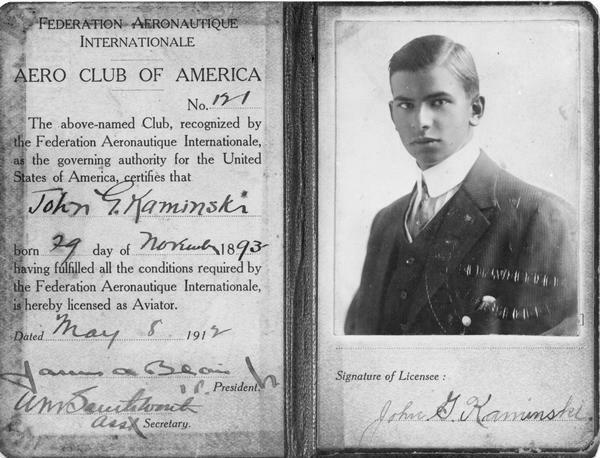 License #121 issued to John Kaminski in 1912 by the Aero Club of America. License #121 made John Kaminski Wisconsin's first licensed pilot. At age 18 he was also the nation's youngest licensed pilot. After completing his training at the Curtiss flying school, Kaminski qualified for the license by doing two sets of figure eights and two dead-stick landings from an elevation of over 2,000 feet. Like many other aviators of his time, Kaminski was drawn to aviation by a fascination with engines and automobiles, but unlike most others he had not even seen a plane until he arrived at the Curtiss school at North Island, California. That flight must have been indeed thrilling, for it was the famous exhibition pilot Lincoln Beachey that he saw. Kaminski was tremendously impressed, and eventually adopted as his own the checkered cap that Beachey always wore when flying.